Minus the round U bolt, there are two other varieties: Square U bolts are shaped like three sides of a rectangle with rounded corners and semi-round U bolts, in contrast to these, have a shallower curve than round U bolts. These are typically supplied with fasteners which are used to secure the threaded ends of the bolt. Depending on the application, a U bolt may be used in conjunction with a strap which aids in securing or leveling the bolt to its load. The most commonly used materials include steel – either zinc plated or stainless steel, as well as aluminum. U bolts are used in situations in which suspended items need to be attached to the surface of components, or to pipes and other curved or rounded surfaces. Industrial bolts are seen commonly in construction and automotive manufacturing and as such need to be made of strong and long-lasting materials. They are also available in a number of different sizes and may be measured with imperial or metric units. U bolts may be made of a number of different materials, but the most common material used tends to be stainless steel. It is structurally strong and durable, allowing it to be used for heavy duty applications with high load carrying capacity requirements. Stainless steel is also corrosion resistant and so can be used for applications with exposure to moisture or other extreme elements. Other materials can have corrosion resistance added through a variety of coatings, such as zinc or polymers. Metric bolts are more common, as both domestic and international auto manufacturers use metric units to classify the measurements of bolts. These measurements can be in terms of leg or U length, thread length, radius and diameter of the pipe and the curve, as well as pitch measurements. Tensile strength is a major requirement for U-bolts and the required strength will help to determine the best materials and dimensions for the construction of the bolt. Traditionally, U-bolts were formed from hot forging processes which then cut threads onto the ends. More modern methods however use cold-drawn wire to create threads, allowing for a smoother surface and higher strength levels. U Bolts U bolts are suspension bolts that are bent into the shape of a U with threads at both ends. They are classified as round, square or semi-round U-bolts according to the shape of the ‘U'. 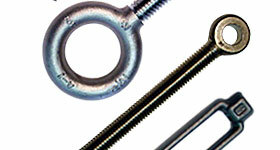 Round U bolts are actually U-shaped and are the most commonly used type of U bolt.